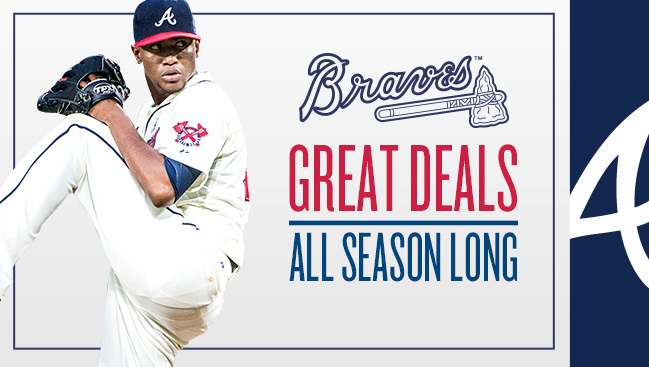 On Sports Clips $8 Mondays, you can buy Terrace View tickets to Braves home games for $8 each. On Coca-Cola $12 Tuesdays, you can buy Club Pavilion tickets to Braves home games for $12 each. If you use coupon code “GASSOUTH” when you order tickets online, you’ll save up to 38% off the gate price when you buy select tickets to most Sunday-Thursday home games during the season (excludes July 3 and October 2). If you show your military ID at the box office, you can buy two-for-one Upper Box or Outfield tickets to select Braves home games. And if you show your college ID or AAA card at the box office, you can buy two-for-one Upper Box tickets to select Braves home games. Available 2.5 hours before every game, you can buy $1 SkyLine seats at the Turner Field. The tickets are available for purchase at the Ticket Office window located next to the Museum entrance in Monument Grove; limit one ticket per person, cash only. $25 buys an Atlanta Braves Kids Club membership. You’ll get a voucher for BOGO tickets to a Braves home game (multiple seat options), two tokens to play in Scouts Alley, two passes for VIP Batting Practice Experience (any Monday-Thursday home games), a welcome letter from Freddie Freeman, VIP Access to Kids Run the Bases after Sunday home games, free admission to the Braves Hall of Fame, two free tickets to a Gwinnett Braves game, a Chick-fil-a sandwich coupon, discounts at the Braves Clubhouse Store at CNN Center, & more. Generally I don’t read article on blogs, however I would like to say that this write-up very forced me to try and do it! Your writing style has been amazed me. Thanks, very nice article.